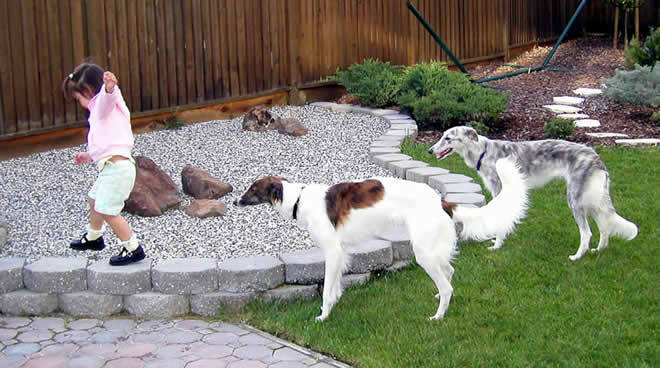 The Silken Windhound is a small, long-haired sighthound that is equally at home running in the field, playing with other dogs or people, or snuggling with their loved ones. This is a relatively new breed that is rapidly gaining recognition in the U.S. and around the world. 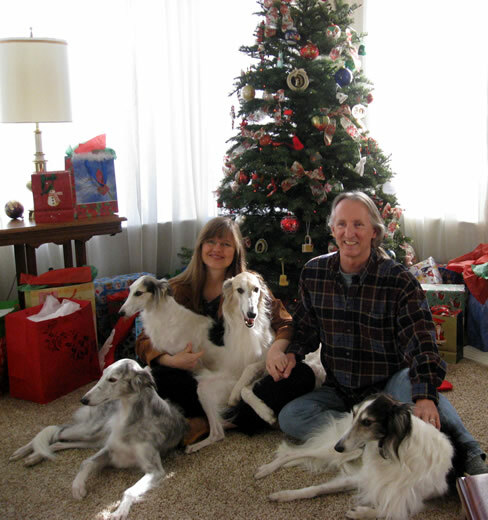 Elessar Hounds is a small Silken Windhound kennel in the Central Coast region of California. Our hounds live in our home with us as loving companions as well as being show dogs and well-rounded athletes who enjoy racing, lure coursing and agility. While it is easy to mistake Silken Windhounds as fragile due to their slender and refined physique, they are actually surprisingly hardy and can romp and play with the best. 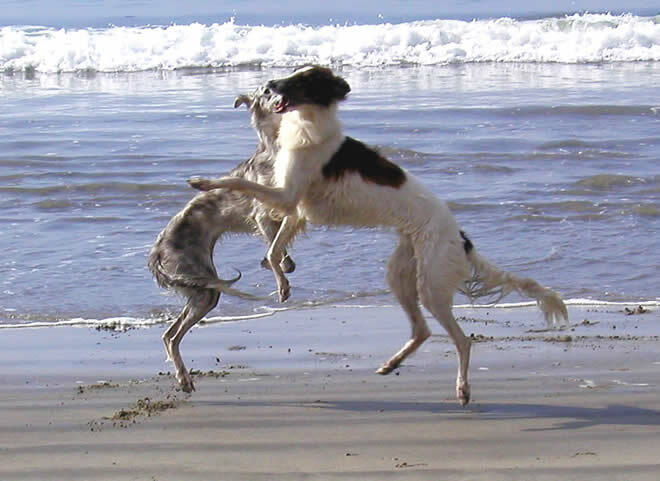 Kyra and Strider love a good romp at the dog park or dog beach, either together or with other dogs of almost any size. They generally adapt their play to the dogs they meet, spinning and posturing with Charlie the Bull Mastiff, running and dancing with Cassy the poodle mix, and bowing and tip-toeing with a small group of Pomeranians. 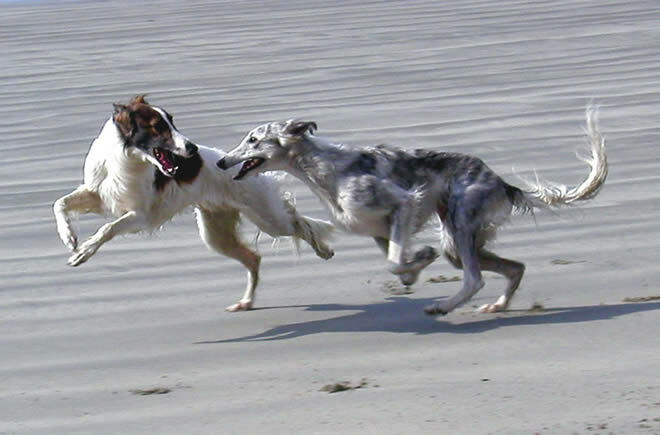 While they enjoy a good romp in the sun, Silken Windhounds are generally wonderful with children and adults of any age. They are intelligent and gentle, and quickly adapt to the preferred games of their humans, as you can see in the picture below of a mellow game of follow the leader. 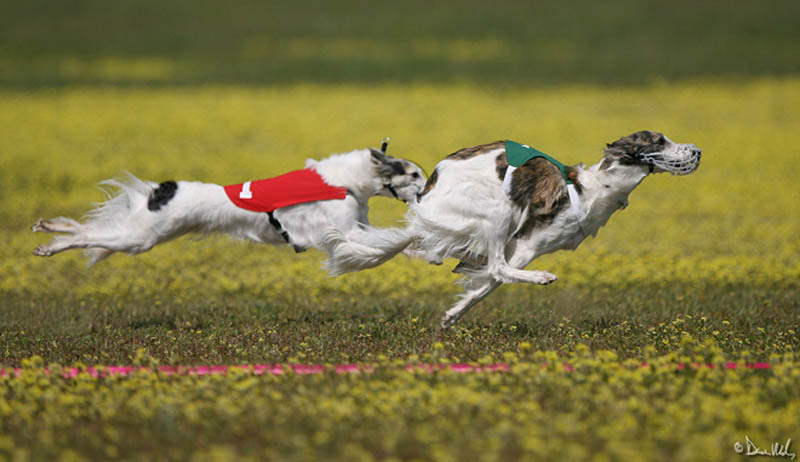 Silken Windhounds are terrific at performance events including straight and oval racing, lure coursing and agility. Isis, our pick puppy from our Garden Roses litter (Strider x Kyra), was one of the first International Silken Windhound Society Dual Champions for earning both ISWS conformation and racing championships. She is a refined little girl with a lot of heart. Isis earned her first conformation championships and Best in Show at only 2 years old, finished her straight racing championship in only eight months and earned her lure coursing championship in only six months. Isis was the first Silken Windhound to earn ISWS championships in all three venues - conformation, racing and lure coursing. 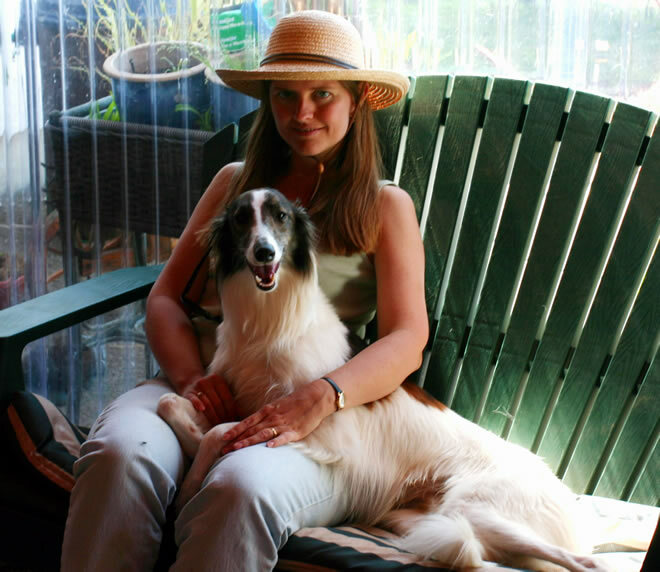 Silken Windhounds are terrific at snuggling, too. They seem to be able to sense when they are most needed and how. Below is a picture of Strider comforting me when I was under the weather and wanted to sit quietly during NW Fest in Portland, in spite of a variety of other possible fun activities and opportunities to play. Site Creation by LS Designs. Copyright © 2005-2009. All Rights Reserved.